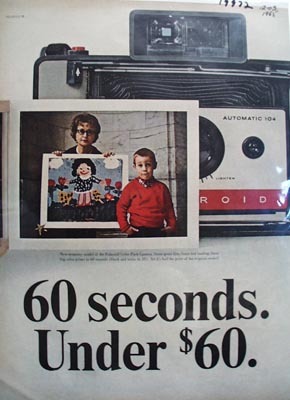 Polaroid 60 Seconds Under $60.00 Ad 1965 This is a December 3, 1965 advertisement. It is a nice color ad from Polaroid Camera. Shows a big picture of the camera. Shows a Mother and her small son and she is holding up a picture that I would s her son has colored. In excellent condition. Photo is taken through plastic and may show wrinkles or crookedness that is not in the ad. This magazine tear sheet measures 10 1/4"" wide by 13 3/4"" tall. Items Similar To "Polaroid 60 Seconds Under 60.00 Ad 1965"